I remember catching my very first glimpse of the concept art for the newest major thrill attraction coming to Walt Disney World in the now discontinued Disney Magazine. A new “roller coaster-type attraction” was on the horizon for Disney’s Animal Kingdom: Expedition Everest. I can remember imagining all the excitement such an attraction would bring. Immense, highly detailed, and thrilling, Expedition Everest promised great things for a park in great need of something spectacular. Indeed, Expedition Everest was going to offer fans everything they had come to love about Walt Disney World attractions. At the top of this list was the news that Expedition Everest would feature the fastest, most fluid, largest, and most advanced animatronic figure of all time, a twenty-five foot tall Yeti; the mythic Himalayan version of the abominable snowman, the guardian of the mountains. Disney went to great lengths to be sure that the general public was very aware of the Yeti, now clearly billed as the hands-down highlight of the new attraction. Having experienced A-Mode Yeti several times, I can tell you that it was quite terrifying. The train slows just a bit as you enter that last cavern, and you hear an ungodly roar just before you turn the corner to see this huge, 25-foot monster glaring at you. Well lit and fluid as ever, you’d have sworn his huge five-foot diameter hands came within inches of the train as he literally lunged at the vehicle. The coaster was great, but it was this climactic moment that left you breathless when the train came to a halt in the station. You really felt as if you had just escaped the Yeti’s terrible claws. However, after only a year (give or take a few months), the famed, longed for, highly anticipated, insanely advanced Yeti animatronic entered a non-moving, immobile state now known unaffectionately as “Disco Yeti.” Also known as “B-Mode,” Disco Yeti was dubbed as such because that terrifying, free flowing, lunging Yeti is no more. In its place is a still figure, barely lit except by the occasional strobe that is so quick, it is easily confused with your on-ride photo-op. 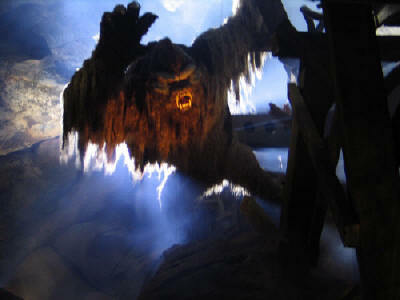 For the last seven years of the attraction’s existence (essentially the vast majority of the coaster’s life), the Yeti, the prize of Disney Imagineering at the time, has not been operational. The first logo to be released for Expedition Everest featured a mountain peak-looking focal point, which upon closer look also doubles as the Yeti’s furry head, the two “e”s in the wordage composing two red, glowing eyes. You will do well to find any remnant of this logo today. Also, earlier advertisement for the attraction was heavy on the Yeti. It promised a certain encounter with “The Guardian of the Forbidden Mountain,” and clearly billed that encounter as the highlight and climax of the ride. The prevailing ruling on why the Yeti no longer works in full A-Mode is that the Yeti figure itself moves so powerfully and so forcefully it needed its own compartmentalized section of show building to withstand the pressure. Apparently, even the foundation of this structure began to crack and wear with the ever-forceful (and impressive) lunge of the immense figure. It was seemingly deemed unsafe for full use. “Why so long to fix?” That was my question as well. Now that you’ve spent millions of dollars on an attraction that was to feature this game-changing figure… why let it rot in “Disco Mode” for seven years? Disney’s Animal Kingdom Park opened in 1998 to much commercial fanfare, but aside from the massive Kilimanjaro Safaris attraction and Dinosaur (then called “Countdown to Extinction”), the park didn’t have much in the way of ride-type attractions. The arrival of Kali River Rapids soon after the park’s opening gave a small bump in that direction, but it wasn’t until 2006 and the opening of Expedition Everest that Disney gave a loud answer to the demand for more attractions. That being said, the park still doesn’t have much in the way of serious E-Ticket (top billed) attractions; and with Expedition Everest as the park’s main draw both visually and otherwise, management simply can’t afford to shut it down for the length of time necessary to return the Yeti to its first glory… Unless something large is added to the park. With the announcement of and groundbreaking for the much-anticipated “Avatar-Land,” now known as “Pandora: The World of Avatar,” Animal Kingdom is set to receive Walt Disney World’s largest and most comprehensive park expansion to date. Speculation seems to agree that when this large expansion opens in 2017, offering a whole new land and several new major attractions to enjoy, Expedition Everest will receive some long overdue TLC. Here’s hoping that when the big flying dinosaur things and naked blue people finally arrive, they’ll bring a new Yeti with them!